NEW! 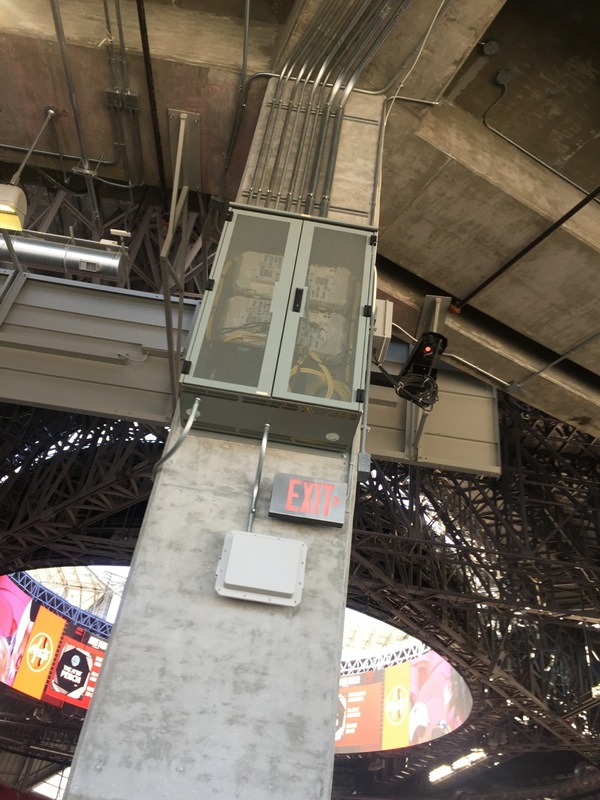 Stadium Tech Report Podcast, Episode 1: What does Super Bowl 50’s Wi-Fi record mean for stadium tech pros? Take a listen and let us know what you think in the comments! 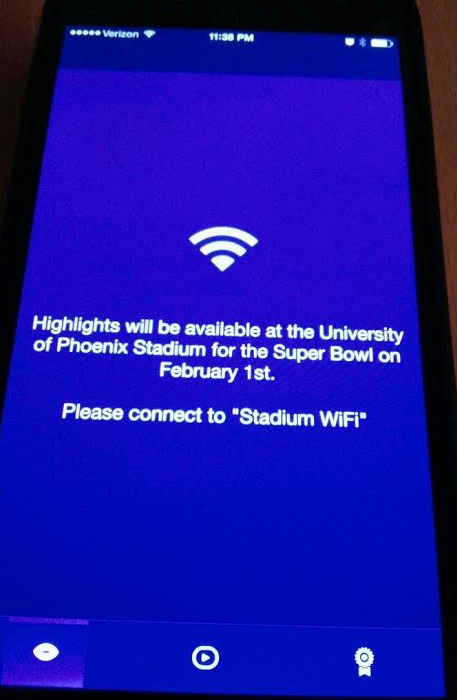 Screen shot of Super Bowl app for this year’s game. 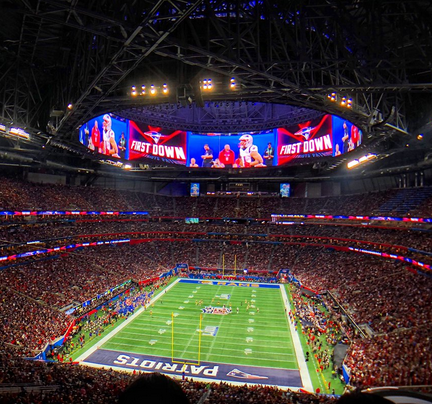 We’ve been waiting for official word on what the YinzCam-developed app for the Super Bowl will look like, and though there’s no press release the page where we are guessing it will eventually be available is offering some details, like the availability of instant replays from different camera angles, video of Super Bowl commercials, and stadium maps. YinzCam founder and CEO Priya Narasimhan had told us earlier this year that a Super Bowl app was in the making, and apparently it will contain features found in some of the latest YinzCam app deployments, such as the Seattle Seahawks’ new stadium app, which has multiple camera angle replays. 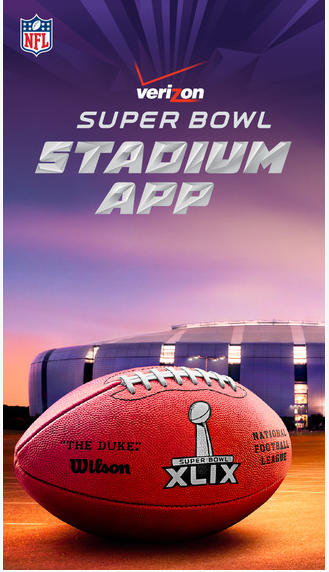 The Super Bowl app is different from the Arizona Cardinals’ regular stadium app, which was also built by YinzCam, which also features instant replays. 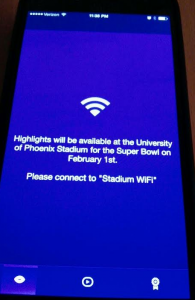 We were able to download the app for iPhone (it’s free) and apparently you will need to be connected to the stadium Wi-Fi (which has the clever SSID of “Stadium WiFi”) in order to view highlights and other video options. 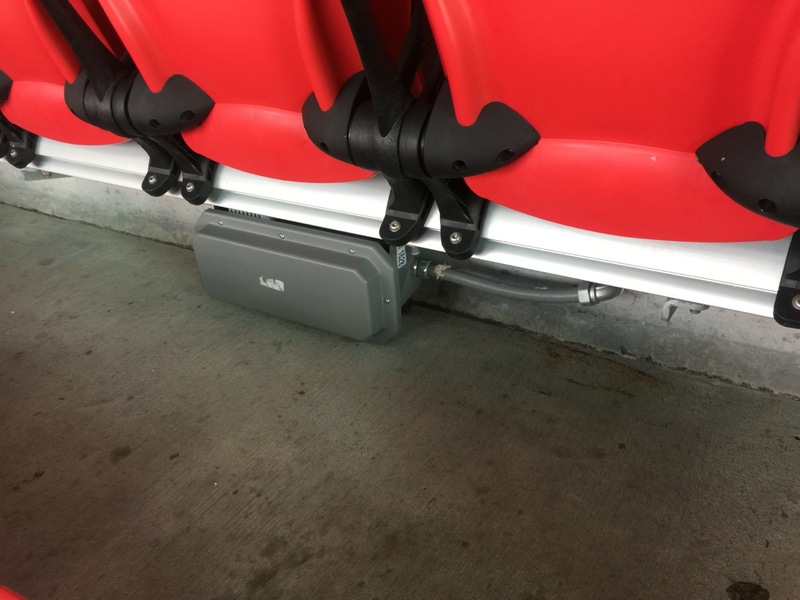 The good thing for fans at the big game, there will be plenty of networking horsepower to keep the app running, no matter where you are. If you’re inside the stadium there is a new Wi-Fi network and a refurbished DAS deployment to keep fans connected; stay tuned next week for our big breakdown of DAS deployments and carrier plans to keep the Super Bowl crowds super-connected. Usage of the Wi-Fi network at the San Francisco 49ers’ new Levi’s Stadium continues to hold steady at 2.3-plus Terabytes of data offloaded per game, according to the most recent statistics provided by the Niners’ network staff. 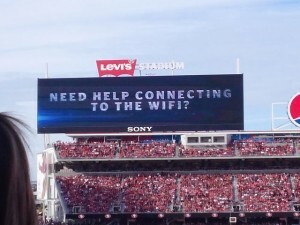 Though he’s no longer the team’s vice president of technology, former Levi’s network guru Dan Williams remains as a game-day consultant to the team, and he shared some recent network statistics with MSR, including some app usage marks that show Amazon Cloud Drive and Google APIs being among the top two applications being used over the Levi’s Stadium Wi-Fi network. According to Williams’ numbers, for the Niners’ Nov. 23 day home game against Washington, the Levi’s Stadium Wi-Fi network had 22,095 unique users, 35 percent of the total attendance; the peak number of concurrent users was 14,700, reached at 2:50 p.m. (near halftime), and the total data used was 2.31 TB, between the hours of 9 a.m. and 5 p.m.
During the Thanksgiving day game against the Seahawks, the network had 23,371 users (36 percent of attendees) who used 2.38 TB of data, with a peak of 16,800 concurrent users at 7:15 p.m.
Video-replay statistics from the Levi’s Stadium app apparently do better when there are more home-team highlights to watch. During the victory over Washington, 1,074 fans watched 4,885 replays, with the 30-yard TD pass from Colin Kaepernick to Anquan Boldin racking up 953 total views from 398 unique users — meaning many users are watching the same replay more than once (maybe showing it to people sitting around them?). For the Seahawks game, 1,407 fans watched 3,875 replays, with a Kaepernick pass to Michael Crabtree accounting for the most views, 487 total from 180 unique users. The top 4 apps used by fans on the network varied a bit from the two close games, but according to Williams Amazon Cloud Drive was the top app for both recent games. 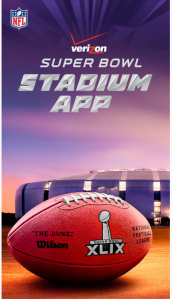 For the Seahawks game, the next three top apps were Google APIs, Facebook and SnapChat, while for the Washington game the next three top apps used were stadium video, Google APIs and Apple iTunes. 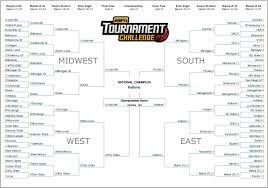 The NCAA Men’s Division 1 Basketball tournament, or as it is better known March Madness, has already started but there is still time for those that wait until the 13th hour to get their act together to both follow the tournament as a fan and your bracket as, well also a fan. First and foremost is watching and following the games and Turner Sports, along with NCAA.com and CBS Sports have simplified that by making all of the games available online, with some requirements for the viewer. You can go to the March Madness main page for more information; the key is finding the “Select TV provider” button in the upper left corner as you must have a qualifying TV service contract to watch online. The effort by Turner et al may shake up how future major sporting events are broadcast and garnered solid reviews in Fast Company. There is also a twist for the Final Four television coverage, where there will be separate announcing teams on alternative Turner channels. The SI roundup has a good description of what’s going on, television-wise. Pretty much any newspaper, blog, web site and sports channel has a contest, ranging from billionaire Warren Buffett and Quicken Loans’ offer to pay $1 billion to anybody that picks all 64 winners to local office and bar pools. The next games start Thursday and many pools allow you to enter up until just before tipoff of that round. If you are looking around for something that is not in the mainstream but will connect you to everybody that you might want to chart with, or talk trash with. An app launching in support of the iPad in time for the tournament is called FanKave, and it functions much like you might imagine. You enter a ‘Kave’ for each game and can talk, both online and using voice, with friends or rivals while receiving play-by-play results. A nice feature is that from a Kave a fan can post to a variety of social media sites such as Facebook without needed to open a separate app for that. The app supports more than simply the basketball tournament, with the NFL, NBA and NCAA football available now and MLB and FIFA World Cup 2014 expected soon. It is currently available only on the iPad platform but its developers said that iPhone and Android versions are expected soon. A more established mobile app called theScore is also trying to make hay while the tournament’s sun shines by adding a number of additional features that revolve around March Madness. Among the new features is an ‘upset tracker’ that uses push notification to let users know that an underdog is leading with 5:00 minutes in the game. There are plenty of established apps as well and pretty much everybody I know has multiple ones to follow both the tournament but also teams that they are interested in. Checking out specific schools can get you apps that (sometimes) enable you to closely follow the team’s progress through the tournament. NBC’s broadcast of the Olympics should be boon to its online and streaming viewership, even though this is something that the network has made available for some time. As with many apps and capabilities users often only discover them when looking for specific tool or event. There are a surprising number of apps available for the upcoming 2014 Winter Olympics that will be held in Sochi starting later this week. They range from simple calendars to one that will be showing live events. Actually this is probably not surprising but then it’s hard to say why you would want something aside from the one that is available from NBC Sports, the official broadcaster of the games. 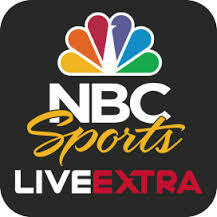 Aside from the fact that the app, NBC Sports Live Extra, is from the broadcaster it was hardly just conceived for the Olympics. The app also provides live sports events that air on NBC, NBC Sports Network and the Golf Channel so that over the course there will be IndyCar, the PGA Tour, Premier League Soccer and the NHL to name just a few. We have already mentioned most of the features of the app as it pertains to the Olympics but it’s good to mention that there will be 1,000 hours of live streaming video with some replay on demand capabilities. It is free to use with select caveats. However if you are looking for different functionality there are plenty of options starting with the U.S. Olympic team’s official app. It details who has made the team, links to athletes’ social media and an up-to-date following of how they do. Another general purpose sports app, this one with a more international flavor, which will have a special focus on the Winter Olympics, is BBC Sports. It will have live coverage of events at the games and can be used to follow a wide range of International sports. 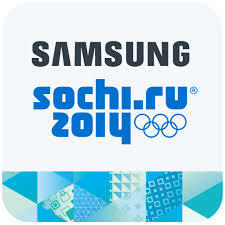 An interested app is the Sochi 2014 WOW (Wireless Olympics Works) that comes from Samsung Electronics, one of the major sponsors. The app is customizable so that a user can have it focus on their specific interests. Not too surprising is that it is also optimized for Samsung devices.